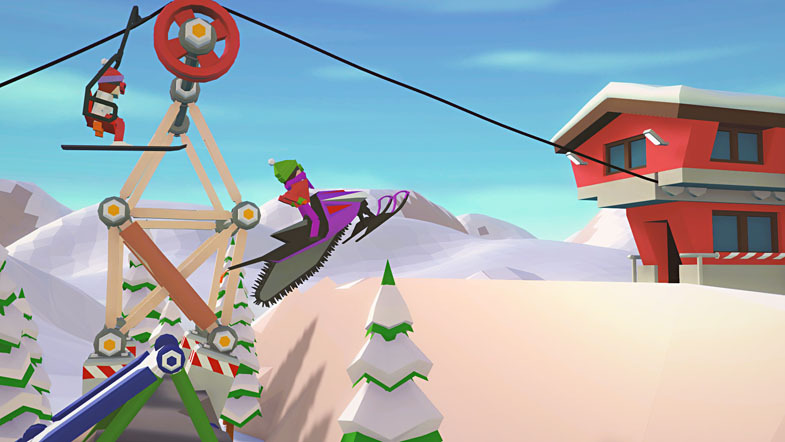 Carried Away, developed and published by Huge Calf Studios, is an Early Access simulator for building ski slope structures, where your job is to help skiers get where they need to go. (In one piece, ideally.) While the concept is simple, clever design has made this title complex, challenging, and variegated. Execution is the most pressing problem, as performance, controls, visual indicators, and a lack of instructions all make playing Carried Away more akin to skiing on mashed potatoes or crust than fresh powder. It's not just a matter of being dense, though. Sometimes you're given misleading information, or no information at all, which makes things less enjoyable than they need to be. When bridges were introduced for the first time, I was restricted to using materials I had already been using to build other structures, and given no instruction on what to do differently. Since I was limited to using the Jumps material, I constructed a jump, even though I was skeptical that a skier could jump such a vast distance. Well, it turns out that you don't have to use Jumps for jumps — you can lay the Jumps material flat, simply using it as a surface. If I had been told that from the start, or if the Jumps material was named something different, I never would've had a problem. As there are instances similar to this one that can lead to confusion, hopefully Huge Calf Studios will address them before moving the title out of Early Access. The gameplay is a perfect snowstorm of puzzle solving, humor, and mechanical skill. There are achievements you don't have to strive for, but you can. Just attempting to pass the 70+ levels presents a decent challenge on its own. But if you want to earn Medals you'll have to meet the Objectives for the level, which requires working smarter. Trial and error will eventually lead to a solution, but efficiency demands that your brain is engaged. Building within a budget, keeping skiers safe, and collecting stars are some examples of tasks that help add an optional layer of difficulty. If you master all that, a final challenge awaits: try to top the leaderboards with the best score. With so many tantalizing challenges, it's easy to stay motivated and entertained, as long as you enjoy building things and don't mind failure along the way. There are two modes to enjoy, which you can switch between at will. The first is a building mode, where you plan, then build and edit your structures. The second mode is a simulation, which tests your structure under real conditions. Sometimes hilarious results occur when switching to simulation mode, such as your structure crumbling to the ground before weight is even applied to it, or your poor, unsuspecting skiers you're using as guinea pigs die horrible, violent, yet comical deaths when something doesn't go right. (You could purposely try to kill the skiers, too, but... that would be wrong.) If morbid spectacle isn't your cup of tea, or if you want more, you can adjust the level of gore. The problems in Carried Away are like a snowball rolling down a mountainside, which, if unchecked, could become an avalanche that destroys. In this case, it's the player's interest in continuing to play that might be destroyed. Each problem can be worked around, but won't go unnoticed. The controls are too finicky. When trying to edit your structure, it's far too easy to accidentally move, delete, or place something. While there is an option to change the activation keys for the controls, it didn't work for me. (I tried restarting and everything else I could think of, without success.) Also, the visual cues for building need to actually be visible all the time, because sometimes the cursor or foreground object obscures them. Thus, what was meant to be a helpful indicator in reality is reduced to being merely theoretical. Performance is unimpressive. Considering the requirements as listed on Steam are 2 GB RAM and 1 GB for graphics memory, yet I played Carried Away with 16 GB RAM and 1.5 GB memory, with the graphics turned down, but it still made my computer sluggish, there is something very, very wrong. 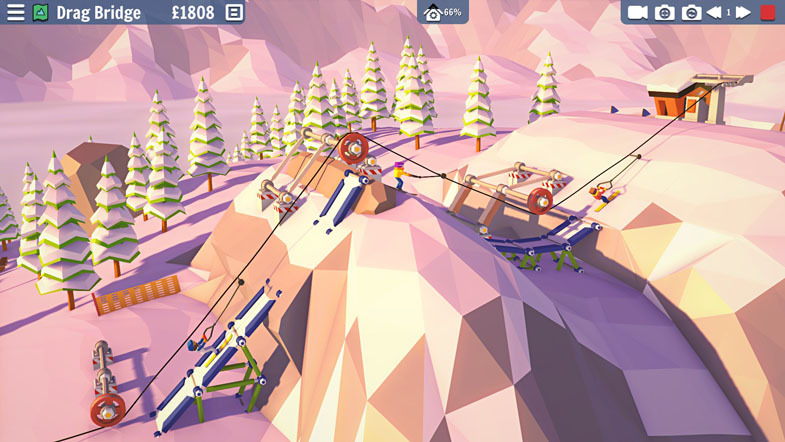 The graphics are cute, low-poly meshes that should be as difficult as fancy web browsing for a modern computer. If all the background physics calculation going on is to blame, then Huge Calf Studios needs to focus on optimization. The simulation mode is supposed to help you figure out what's wrong with your structures by turning all your used materials different colors, effectively mapping how much load each part bears. Green for good, yellow for fine, orange for concerning, and red for insupportable. While this feature does help you understand your structure, I found that it couldn't help me locate specific problems. Colors that show up in simulation mode are retained in build mode. But if there was only one red log in my build, for example, and I added some structural elements around it to make it turn yellow or green in build mode, I found that it would simply turn back to red when trying the simulation again. While I enjoyed the challenge of figuring out how to solve the problems without such help, some players will not be so understanding. There should be an easy way for you to learn what the problem is and how to fix it. Otherwise, this title is in danger of being inaccessible to players who lack specific skill sets.